Position Sensors Ltd. Linear Sensors. Manufactured in the UK. Motorsport. Formula 1. Autosport. Our standard and custom linear sensors equip teams in the past and current Formula 1, World Touring Car Championships, World Rally Championships, Moto GP and Superbike arenas. With the ability to supply throughout Europe efficiently, we are in the position to serve race teams of all sizes. Position Sensors Ltd. is a leading UK manufacturer of linear sensors for motorsport, autosport and mechatronics. We supply our high performance sensors to the UK, Europe and rest of the world. We produce custom sensors for clients. Some sensors are modifications of standard products and many custom sensors are complete new designs tailored to requirements. 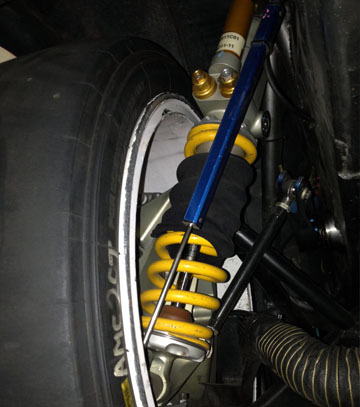 One of our high quality sensors installed on the front suspension of a Chevrolet Cruz. Position Sensors Ltd. is active in the World Touring Car arena. © 2017 Position Sensors Ltd. All rights reserved.